Eduard von Gebhardt was born in Järva-Jaani into the family of a Lutheran pastor, yet went to St. Petersburg already when he was only 17, and three years later proceeded from there to Düsseldorf. That is where Gebhardt received his grounding in creative work, rising in time to become one of the most important painters of paintings with religious themes in all of Germany. Figurative paintings created mostly on subjects from the New Testament (the Old Testament was of surprisingly little interest to him) renewed all of German protestant painting art, whereas it should not be forgotten that he often used Estonians whom he met on visits to his native land as models (for instance, painting his mother as the Virgin Mary). According to Gebhardt’s biographers, the creative work of that appreciated professor and respected painter who received both governmental and private commissions did not change to any great extent since he already found his own style at the beginning of his career path as an artist. After his death, Gebhardt’s creative work quickly lost its meaning, yet over the last few decades it has again attracted the attention of researchers. Gebhardt was already 72 years old by the time this work was completed. This was a time of contradictions for Gebhardt. After the death of his wife Klara (1897), he experienced a serious creative crisis. In one of his letters from that time, Gebhardt says that “I have become so indifferent, my thoughts are still with her”. Nevertheless he continued to work. At least four parallel works are known for this painting. 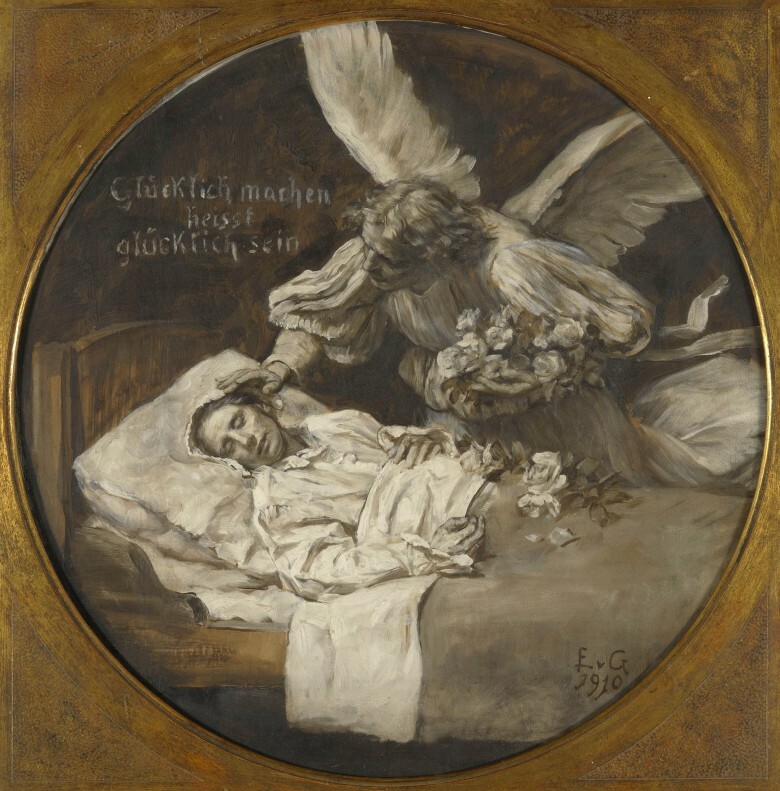 Thus Gebhardt painted the work In the Sick Bed in 1870 already, which has been lost by now. The introduction to this painting, however, says that it was the first version of a painting that depicted the mother of St. Peter. As his model, Gebhardt depicted his wife Klara Jungnick dressed in old-fashioned clothing (this was often customary for Gebhardt). Klara fought a long battle with illness at that time but in the painting she was already recovering. The locations of all the parallel works are no longer known by the present time. If this painting really does depict Klara Gebhardt, then it is possible that this is the latest and only known version of this series. The theme of the healing Jesus that is often repeated in Gebhardt’s paintings has remote parallels to this painting. Thus for instance, two paintings entitled The Raising of Jair’s Daughter from the Dead are known where Jesus bends over a girl lying in a sick bed. 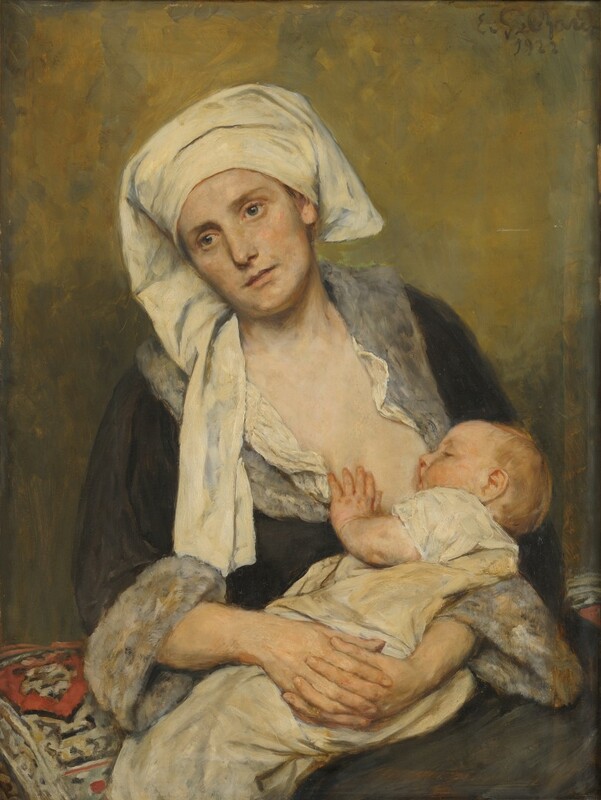 "Mother and Child" was completed towards the end of Gebhardt’s life. Perhaps the most complicated years of his life preceded the work. He had worked intensively until then but then he tired, his eyesight deteriorated and in his letters, he complained of exhaustion from working and that he no longer had any ideas for paintings. “The field that I work in is so narrow and I have picked it relatively clean. It simply isn’t permissible to repeat myself if I don’t have anything new to say anymore,” he wrote. Furthermore, Gebhardt lost practically all his property due to inflation and war loans. Thus Gebhardt was nevertheless forced to continue working in order to alleviate his financial difficulties and to fulfil new commissions. For the most part, portraits set the tone for his work in his last years. Gebhardt painted numerous portraits during his lifetime. It is noted that Gebhardt never painted from memory, so to speak, rather he always used models, and he liked to dress them in old-fashioned, even Renaissance era clothing.